One of the interesting occurrences in connection with the writing of this column is that occasionally a picture that tells more than several hundred words have done, turns up after a story has long since been written. So it is in today’s column, with three pictures that tell the story of probably the most difficult 18 continuous hours ever experienced by the men of the Radnor Fire Company. The description of these 18 hours was given in this column in the February 21, 1952, issue of “The Suburban.” The originals of these pictures have been lent to your columnist by Leslie D. Wilkins, one of the old timers among Radnor township’s fire fighters. 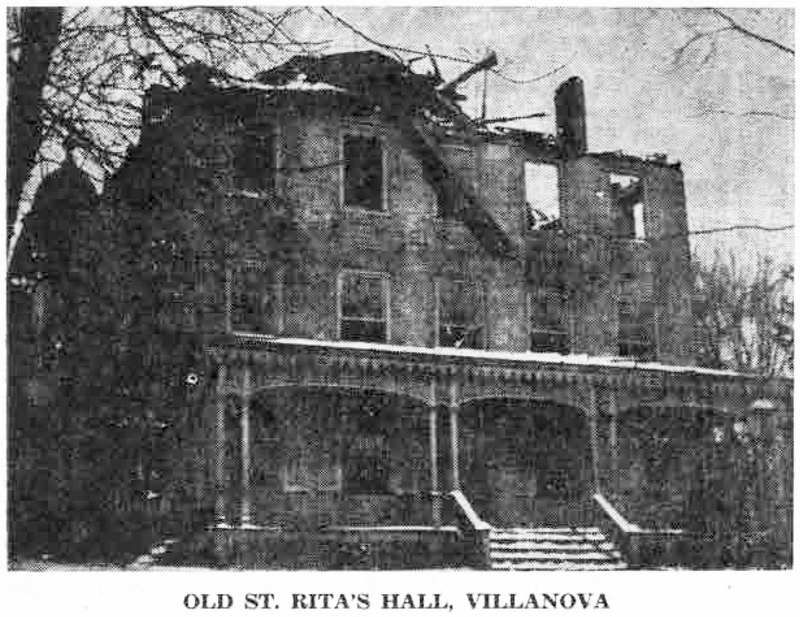 About two o’clock in the afternoon of January 10, 1912, fire broke out in St. Rita’s Hall, the oldest on the campus of Villanova College. It had stood there more than 100 years, having been erected in 1808, almost 40 years before it was purchased for use as the original monastery of the Augustinian Order. January 10 was a bitter cold day, 10 degrees above zero. Of the five suburban fire companies called into action, when it was evident that the efforts of the students were inadequate, Radnor was the first to get water on the blaze. With its line of hose turned right into the midst of the flames, thousands of gallons of water were poured where it was mast effective. By six o’clock that evening it was evident that the fire was under control, with most of the contents of the building saved except those on the fourth floor. The loss was still a heavy one, estimated at $75,000. However, the heroic work of the Main Line fire companies had kept the flames from spreading to the chapel and to other neighboring buildings. In intense cold many of the firemen still remained on the scene for some hours in order to watch smoldering embers that might burst into flames again. Some of the Radnor firemen had scarcely gone to bed after putting their equipment into shape, when their siren sounded for another fire that broke out shortly before midnight. 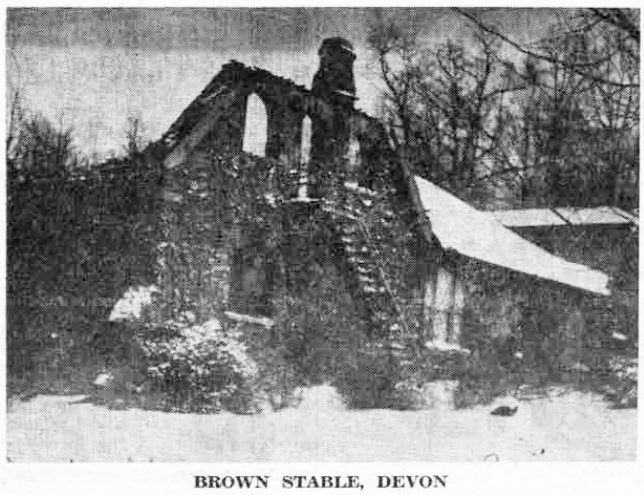 In spite of their weariness, they were in Devon seven minutes after this alarm was sounded for a fire that gutted the stable and garage on the John A. Brown estate, as shown in the accompanying picture. Since the stables were about 1500 feet from the source of water supply, it was necessary to keep the fire in check with chemicals at first until the Radnor Fire Company could borrow additional hose from Berwyn. After that, several hours of unremitting effort were necessary before the flames were out, leaving only the gutted building. Back once more at the firehouse, exhausted, firemen were just beginning to thaw out their hose when John Purnell, who was working for Dr. Robert P. Elmer at that time, rushed across the street to say that the second floor of the Elmer stable was on fire. Awakening from sleep, Purnell had found his bed smouldering from the heat of a nearby coal oil stove. First carrying the stove outside, he had run across Audubon avenue to summon help from the fire company. 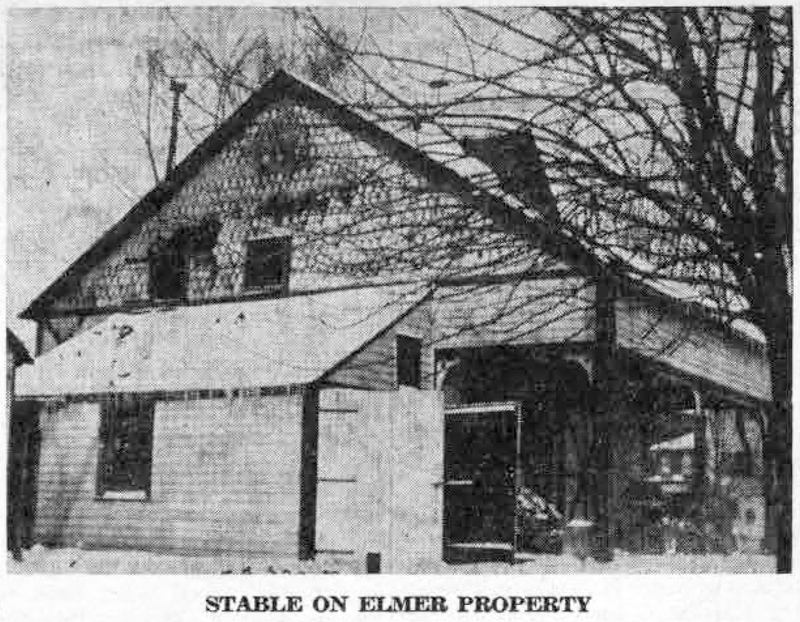 About a dozen of the firemen who were still attempting to thaw themselves and their frozen hose out soon brought the fire under control, thus saving not only that property, but the George M. Aman stable as well, since it practically adjoined that of Dr. Elmer. (The Aman house stood on the site of the present post office building.) Damages to the Elmer stable were repaired to such an extent that the building still looks much as it originally did, more than 40 years after the fire. Unusual as is the circumstance of three fires in such a short space of time perhaps more unusual still is the fact that this story should be preserved by way of pictures more than 40 years later. 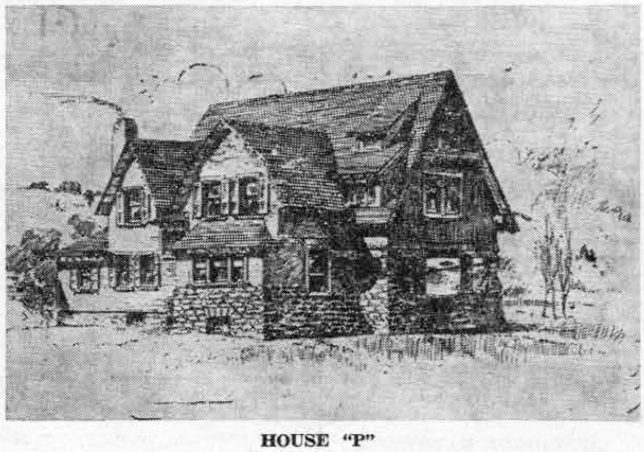 Recently, this column featured architect’s drawings and descriptions of the first Wayne Estate houses, all taken from an early brochure published to advertise a suburb that, in the 1880’s, was developing from a small hamlet, under the guiding hand of a Philadelphia financier, George W. Childs. Starting in North Wayne, this building operation was carried on by the firm of Wendell and Smith, Wayne representatives of Mr. Childs. It spread rapidly to the south side of St. Davids and then to South Wayne. This series in “Your Town and My Town” had not been entirely completed, and since so much interest in it was evinced by readers it is with pleasure that your columnist describes the last two houses. The price of “House P” was $7,000, a lower price than for any that has been shown before for St. Davids and Wayne. Others had ranged up to $9,000 “and upwards”, a figure that was high for the 1880’s and 1890’s. Sketches of the interior plans for this house show the usual vestibule with an outer and an inner door, the latter opening onto a hallway which gives entrance on one side to the parlor, and on the other to the library. In one corner is a fireplace, a home-like feature which marked every one of these early Wayne houses. The dining room and library are identical in size, 13 x 18 feet. Upstairs there are five good-sized bedrooms of which four are corner rooms. While the third floor is not described or illustrated, your columnist’s memory of one of these houses, in which she lived but briefly before moving into a “House B”, is that originally only the front room was finished, with the remaining space used for storage. The bathroom that is now on the third floor of practically all of the houses of this type was added at a later date. “Our Latest Plan” is the foreword of the description of this very elaborate house, for which “no price can be named until the ground it will occupy is first known.” Obviously houses of this type would require a spacious setting to show them off to advantage. Plans show an interior as elaborate as the exterior, with not only the conventional parlor and library on the first floor but a den besides. The second floor, in addition to the usual quota of five large bedrooms, also has a dressing room opening out of one of the front bedrooms. 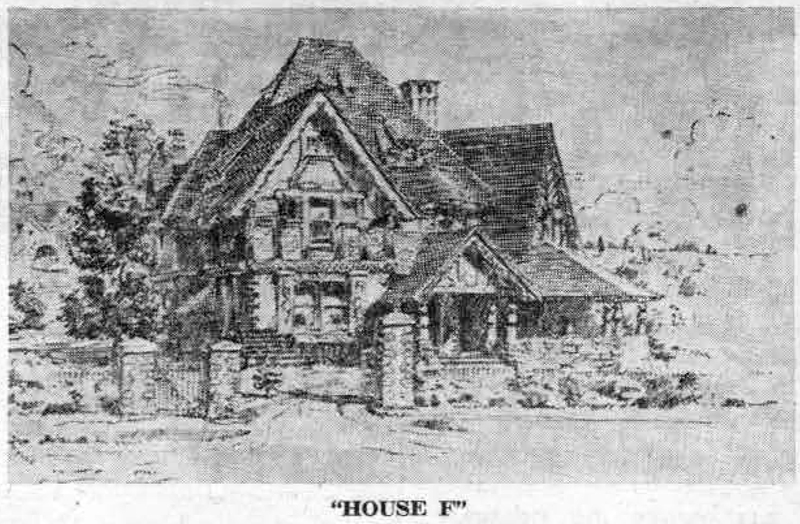 And yet even this house, elaborate as were the plans for it, had, like the other Wayne Estate houses, but one bathroom. No reference is made to third floor space in the description, but the numerous windows shown in the picture indicate that it was probably large, though all under a roof that slanted at a marked angle. With this week’s column we have now shown the 13 houses illustrated in the brochure which has been lent to us by Miss Beatrice Tees and her brother, DeBourg Tees. Our readers need take only a casual walk along the streets of Wayne and St. Davids to see many examples of all these houses. No greater tribute can be paid to the enduring quality of the workmanship than their appearance 60 years later. 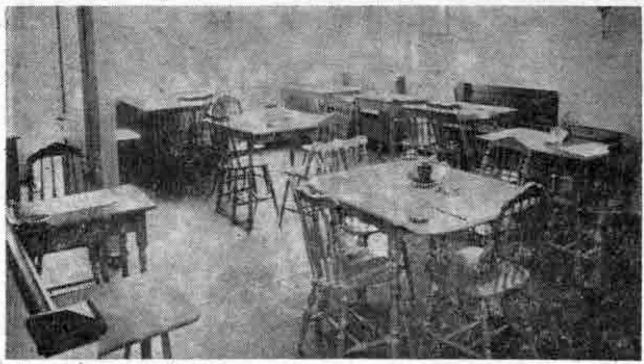 The attractive Tea Room of the Woman’s Exchange, which is located directly over the Exchange at 185 East Lancaster avenue, was opened by the Neighborhood League in 1945. Here luncheon is served each Monday through Friday from 11:30 A.M. to 2 P.M. A new feature recently added is the Friday Fashion Show, which is put on each week through the courtesy of Fanslow’s Corner Shop. 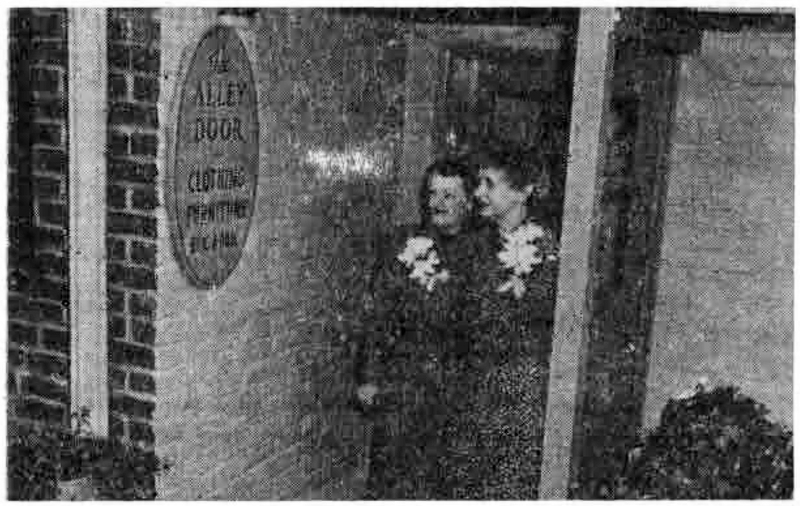 The two women whose enthusiasm, backed by hard work, was largely responsible for the organization of the newest in the series of the Neighborhood League Shops, are shown in the above picture as they stand at the doorway of this quaint little place and look at the new sign which advertises the successful culmination of their efforts. They are Mrs. A.V. Purinton (left), and Mrs. F. Warren Marshall. Credit should go to Mrs. D.L. Trouant, pictured above, chairman of all the Neighborhood League shops, to which your columnist has been devoting her recent columns. Mrs. Trouant went into office last September for a term of two years, succeeding Mrs. E. Mortimer Newlin. 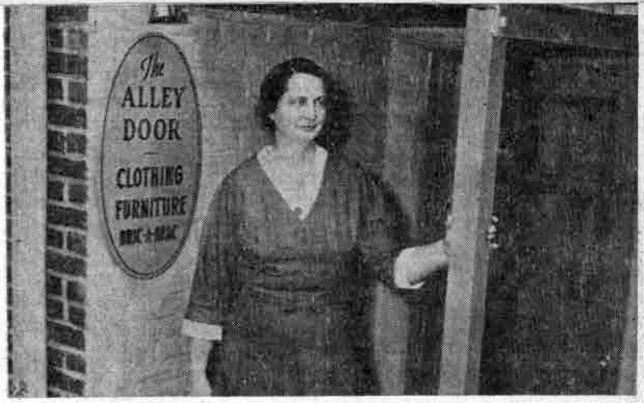 With her and the vice-chairman, Mrs. Kilshaw M. Irwin, rests the responsibility for the coordination of the work of all the shops. With today’s pictures this series comes to a close in “Your Town and My Town.” It has been the story of 27 continuous years of effort on the part of many women, who have worked earnestly to aid Wayne’s own social service agency, The Neighborhood League. Without the profits from these shops it would have been impossible to maintain the League’s high standard of service as they were established in simple fashion 40 years ago, services that have increased steadily with the increasing demands of an ever-growing community. No matter what the hurry or the pre-occupation of the pedestrian who is making his way along the north side of East Lancaster avenue in the 100 block, it is almost impossible to pass the Neighborhood League Shop without at least a sidewise glance into the window. Perhaps the pair of small Staffordshire china dogs that were there last week has now been replaced, or the lovely old Sheffield tray has given up its place to a charming clock a hundred or more years old. In which case, are the small Staffordshire dogs and the Sheffield Tray inside the shop, or have they been sold? Frequently, the passerby turns aside long enough to find out the answers. However, with her hand on the latch of the door she still has to pause a moment to examine the array of fascinating small objects on the shelves in the side window, the small glass pitchers or vases, the bits of chinaware, antique or modern, the intriguing little boxes. And that passerby may as easily be “he” as “she” – for are not the ranks of searchers after antiques made up of as many men as women? 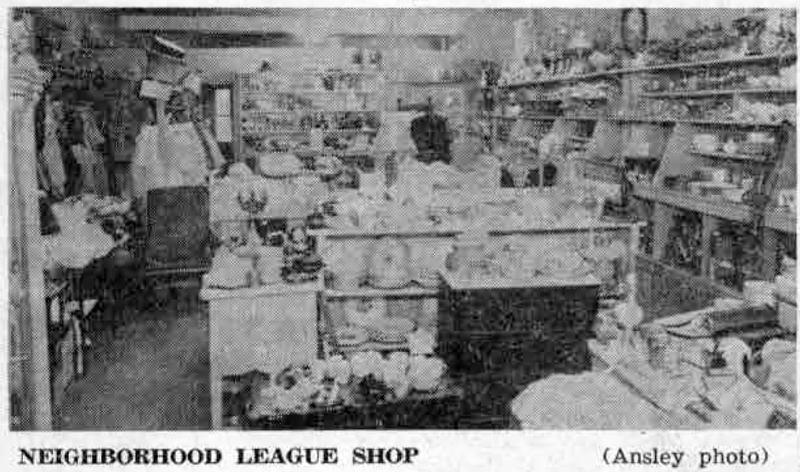 The Neighborhood League Shop has not only antiques for sale – some of the merchandise is at least as new as yesterday… perhaps a lamp shade that did not look just right in the living room after it was lit… perhaps the bedspreads did not match the curtains, or the table did not fit into the space for which it was bought. One look at the interior of the shop, as shown in today’s picture, tells the story of the variety of its merchandise, old and new. There is in sight a chest of drawers, a rocking chair and a coffee table. There are table linens and bed linens, curtains, lamps and lamp shades of all kinds and descriptions; pictures and picture frames, electrical equipment, chinaware, glassware, and many pieces of brass, both modern and antique. All this has been assembled in one small, but attractive shop, to provide a means of buying and selling on a commission basis, with the net profit going to the vitally needed work of the Neighborhood League in this community. Mrs. Gibbons Tatnall is the present chairman for the Neighborhood League Shop. Mrs. C.W. Hess, assisted by Mrs. George W. Wilson, is its manager. And each day a different volunteer assists these two in the sales end of the business. Just to the left of the entrance to the Neighborhood League Shop is a door that leads up a flight of steps to a hallway running the length of the second floor. 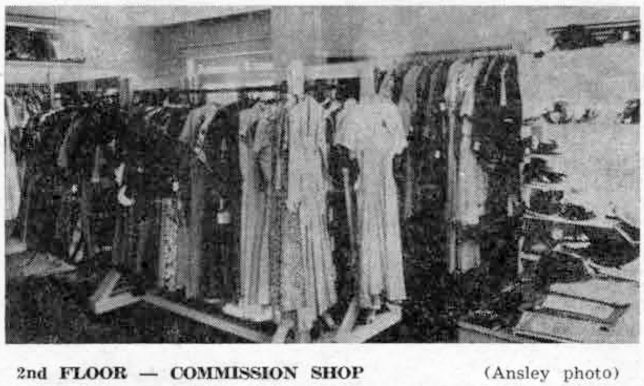 This houses the Commission Shop, of which Mrs. C.H. Whittum is chairman; Mrs. Robert G. Wilson is manager, and Mrs. Kenneth Foster, assistant manager. With the help of interested volunteers, clothing is sold to men and women, as well as to boys and girls over 12 years old, who cannot be fitted in the Children’s Shop on Louella avenue. The stock of clothing sold here is large and diversified. The front room, pictured below, holds women’s dresses, hats and accessories. A new sales room has been added recently, just back of this first room, where smaller size suits, coats and “formals” are on display. And at the far end of the hallway is the room devoted to men’s and boys’ suits, jackets, overcoats, tuxedos, and dress suits. Sweaters, shirts and shoes are also in stock. All these articles, many of them practically new and all of them in excellent condition, have been placed here to be sold on commission. The benefit is three-fold. The original owner receives adequate returns on good clothing, the buyers have the advantage of obtaining many excellent articles at very moderate prices, and the Neighborhood League reaps the profits, which, like those from its other shops, go to the work of that organization.